I’ve no clue how to connect the Xochipilli, the Aztec god of art, games, beauty, dance and flowers (and apparently a patron of both homosexuals and male prostitutes?!) to psychedelic trance scene, but if that was an excuse to put his statue on the front cover of the album, then I don’t f***ing care. I mean, just look at it!!! In a way though, the cover serves as a fitting description of what’s on the disc. The music is rich in detail, very - technically - complex and multidimensional, yet it retains this brightness that’s rare with most darkpsy releases, because ...it’s not really darkpsy at all. If you’re familiar with the output of such labels as Bom Shanka - where Bruno Isidro a.k.a. 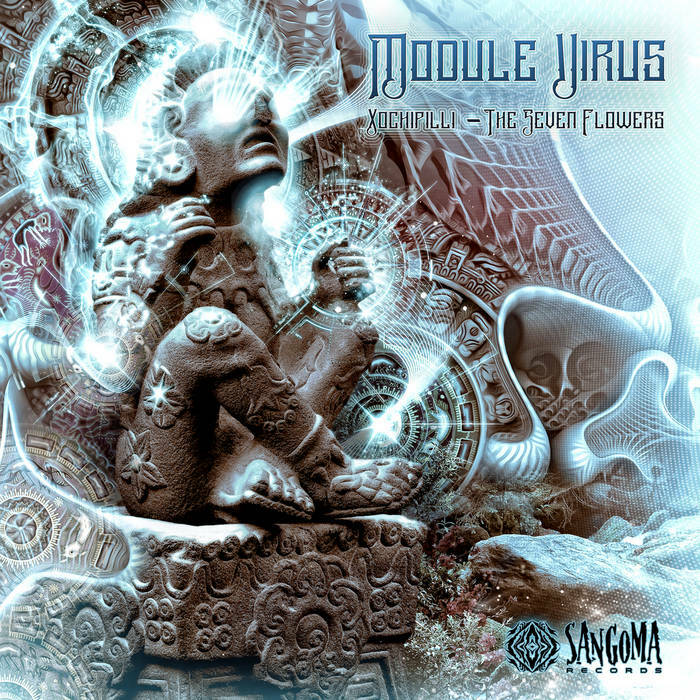 Module Virus debuted and released 2 albums - Wildthings or Looney Moon; they all represent a similar brand of psychedelic trance: funky, very rhythmical and precise, analogue-sounding and non melodic, futuristic and cybernetic instead of evil / dark / nocturnal. While most of the releases on those labels have slowly fallen into the Nano Rec. trap of sounding very samey, up to the point of using exactly the same sound patches, samples, effects and mastering techniques; Module Virus managed to stick out - he’s got that knack for putting the right sounds and breaks in just the right places to enhance the dynamics of the music, to make it more energetic and driving instead of just droning. I’m pretty sure that for a lot of people all tracks will sound the same ...and that’s largely true, because it’s not a concept album (at least I fail to see it?) and more of a collection of dancefloor-tested “choons”, but there are ups & downs, peaks & valleys, some tracks are softer and more “foresty”, while others are hard hitting and get right to the business. Some tracks actually get a bit melodic - “Identical Formulas”, “Robotic Elements” and “Thriving” in particular - with acid lines or background atmospherics providing a semblance of traditional musical progressions, but if melody is what you’re looking for then stay clear of this one: here the rhythm, groove and electronic stabs, noises and squelches are ruling the land. For my money, it’s one of the standout releases in this style, but it is surely not for everyone - check the samples before purchasing. Enjoying the groovy sound, definitely have to check this out. Been enjoying psytrance more and more lately.